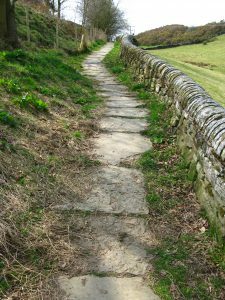 Many footpath maps and walks guides are available from the Discovery Centre , from the Bollington Outdoors website and from the Bridgend Centre . Two free leaflets are available at the Discovery Centre for self guided walks that leave from the centre. Please pop in and help yourself to these. Bollington Civic Society and the Discovery Centre organise guided heritage walks as part of the Bollington Walking Festival held in late October each year. Some start from the Discovery Centre, others from other locations. Please see the Walking Festival page for details. We sometimes organise heritage walks in the summer months. See the Civic Society page for details. Many guided walks are organised by the Bridgend Centre . They have a programme of fortnightly walks – see their web page for details. They also provide self guided walks which require the relevant guide pack – there are presently seven to choose from! These are available for purchase from the Discovery Centre or the Bridgend Centre at a nominal price. Many of these walks are specially designed for children and are therefore short and easy but always with added interest for children including spotting the specially designed way markers. Also, a walking guide book is available for the Poacher’s Inn . This book presents 18 circular walking routes, leaving from and returning to the pub. The book is available for purchase from the Poacher’s Inn . If you think you know the local walks and landmarks around Bollington, test yourself with our fun quiz!